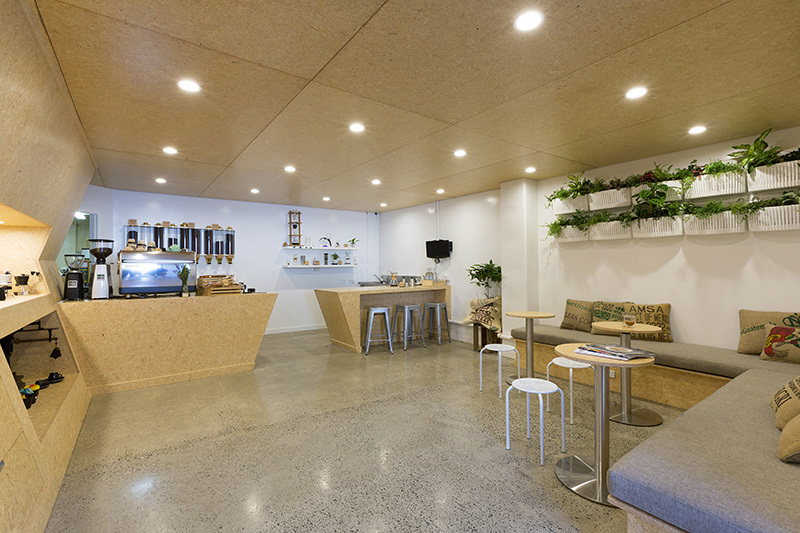 Bubble Interiors have transformed Excelso Coffee in Tauranga, New Zealand, from a dated and dark space with mismatched furniture, into a bright and fresh coffee bar. After 20 years in the bean business Excelso Coffee was beginning to look its’ age. 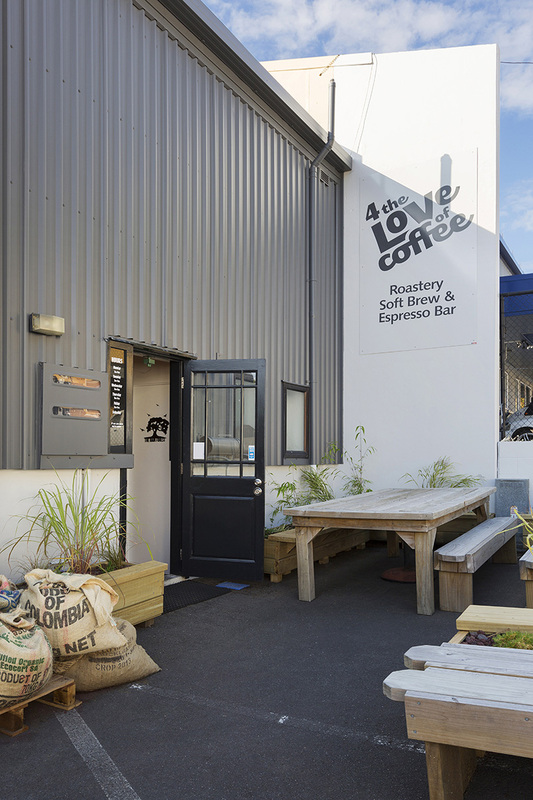 As a roastery, soft-brew bar and barista training facility they had filled two adjacent industrial alleyway sites in Taurangas’ 3rd Ave West to capacity and were growing frustrated with trying to adapt a multi-faceted business to an inflexible space. 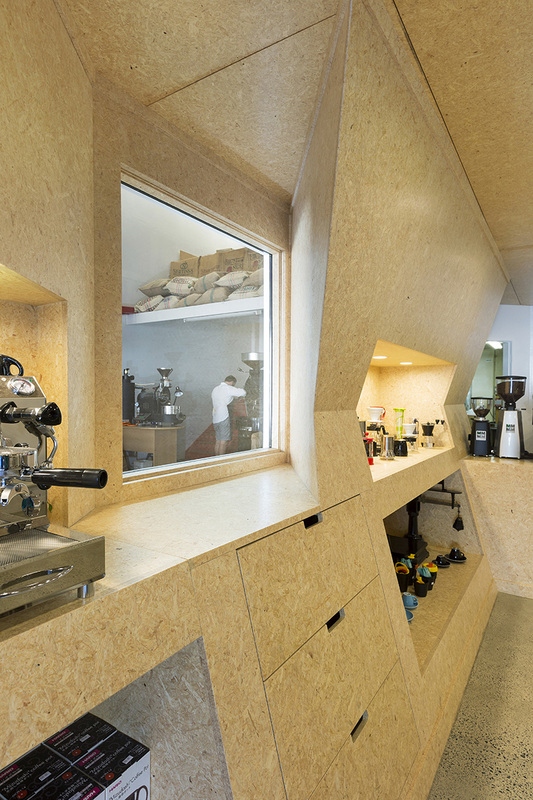 Initially a warehouse space divided into two separate areas, one housing an impressive coffee roaster and the other a cramped, narrow area for an espresso machine, retail display and office. A mismatch of make-do furniture, exposed cabling and a “tradies” toilet left the space feeling dark, cluttered and unfinished. 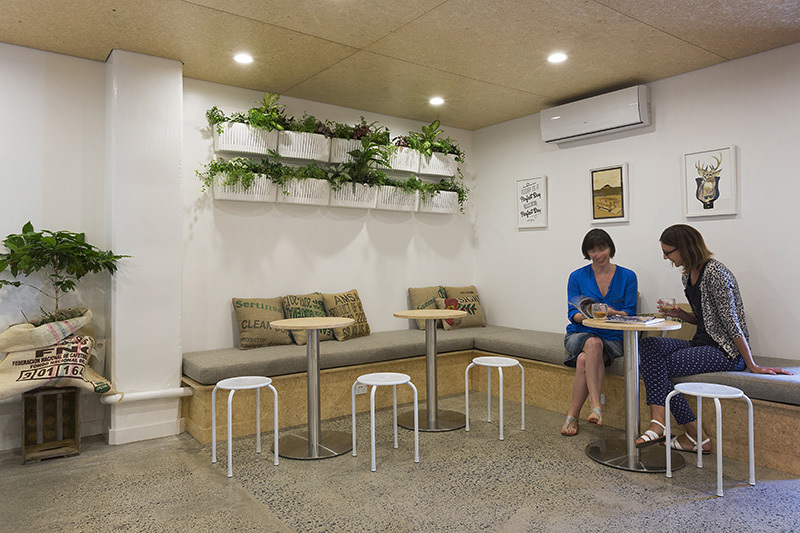 The brief requested a point of difference from other local cafes, with a natural materiality that felt fresh and clean, whilst being complimentary to an upcoming rebrand. Adopting a back-to-basics strategy we re-planned the space focusing on consumer comfort and communicating the ethical integrity of Excelso’s supply chain – 20% of their offering comes from fair trade agreements with plantation producers. We wanted the space to facilitate a more open, direct relationship between barista and consumer, so too between environment and experience. Looking more like a science lab than a coffee shop, soft brew uses single filter pots, siphons and air press processes to produce softer flavours than espresso. 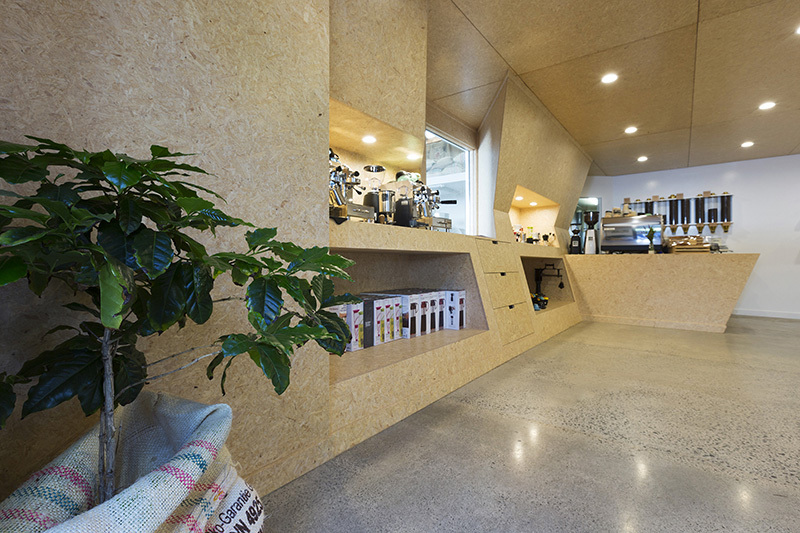 Two purpose-built strandboard counters, one for serving espresso and the other with bar stool seating for soft-brewing demonstrations allows these award winning coffee purveyors to engage directly with their audience in their quest to introduce the coffee drinking public to new and exciting methods. 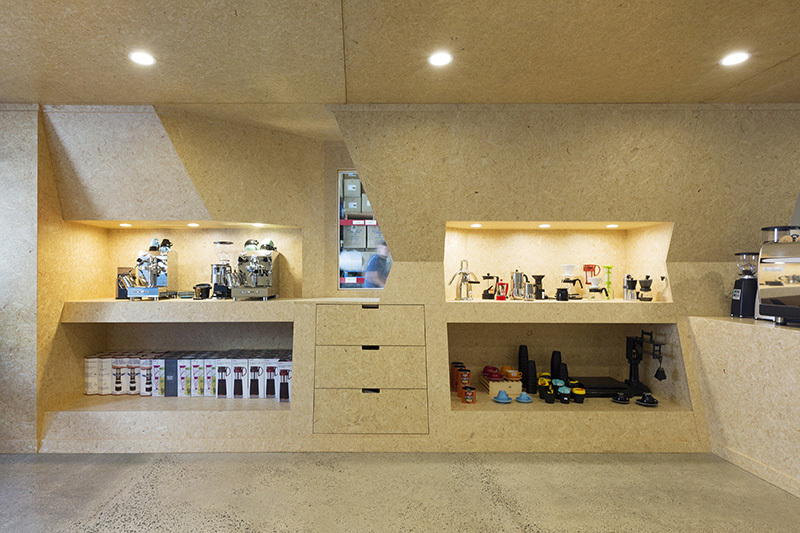 A built-in strandboard cabinetry unit along the dividing wall uses planes and angles to incorporate retail display space and feature lighting with a cleverly placed viewing window allowing a sneak peek through to the roastery. Simple, unobtrusive lighting housed within a strandboard panel ceiling reflects a warm glow from the polished concrete flooring creating a smooth, solid contrast to the particulated nature of strandboard. Clean white floating shelves showcase Chemex beakers and glass tubing. 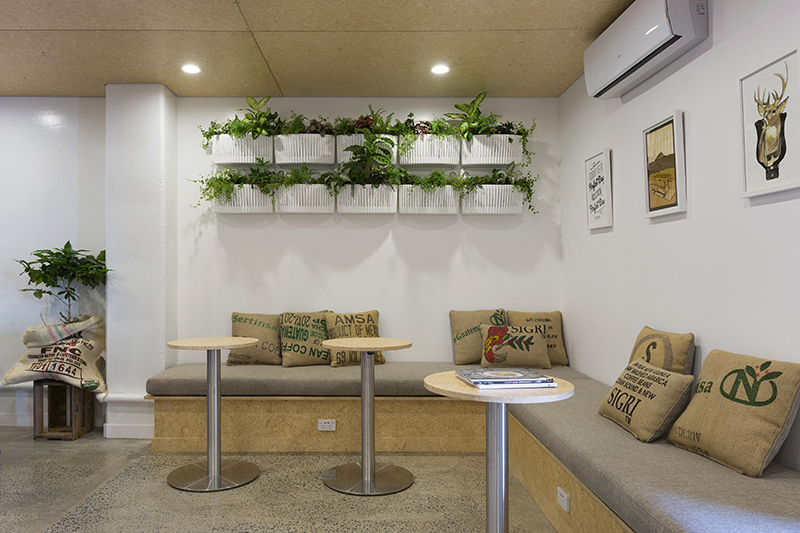 A lush vertical garden above an ‘L’shaped banquette and a collection of small side tables and stools helps frame the space and invites visitors to wait for their order in comfort and style, or sit and luxuriate over a cup of soft brew.